We think of a Home Cinema System as a system that gives you the cinema feel when watching a movie at home. Typically this would be either a very large format TV, or projection system, coupled to surround sound speakers and suitable amplifier. In our view, however, the key thing that makes it a Home Cinema System, rather than a TV with surround sound, is when the picture is large enough for the “cinema Feel” i.e. it talkes up a large portion of your key field of view. This happens when the distance the viewer is sitting from the screen is about one to two times the width of the screen (just check out where the best seats are in a commercial cinema). The scale of the sound has to match the picture for the best all-round experience, and this is where our skill and experience come into play. Modern Object oriented sound formats mean that sounds can be created in 3D all around you. We put together systems which are as different as the different rooms they go into, however there are some systems that just work well whatever room they go into, and some examples of these are on our Example Home Cinema Systems Page. 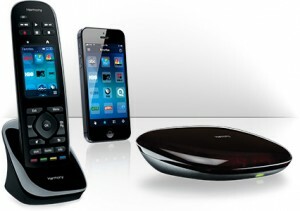 In Home Cinema Equipment, typical sources include satellite receivers, Freeview receivers, Blu-Ray / DVD players, Digital Video Players (see short movie below), Personal Computers, Streaming Video Players, and increasingly also Games Consoles. The Amplifier / AV receiver switches between the home cinema sources, decodes and amplifies the sound, and often is used to scale the image to one of a number of common formats ready for display. These three elements of are often integrated into one device, however higher quality systems split out the audio Power Amplifiers, to prevent them from affecting the power supplies of the more sensitive pre-amp, switching and scaling elements. The AV Reciever or surround processor is the central piece of Home Cinema Equipment that links everything else together. It is key in upholding (or limiting) both the audio and picture quality. 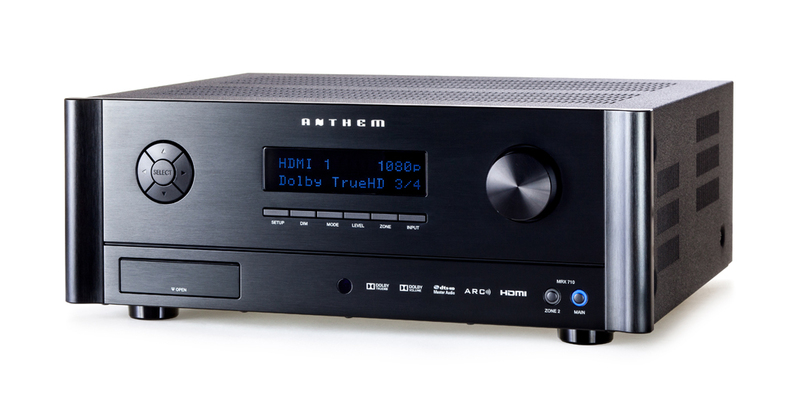 The Anthem AV Receivers are available from our Webstore. Loudspeakers often also form part of the aesthetic design of Home Cinema Systems, as they are frequently large and conspicuous. There is much that can be done to conceal speakers, however you “don’t get a quart out of a pint pot”, meaning that the physics prevents rich deep bass from coming out of a small loudspeaker. We have a wealth of experience of selecting appropriate home cinema speakers for your room taking into account taste size and location. Also we are highly experienced with concealing speakers either on-wall, in-wall, disguised as paintings, or even totally invisible forming part of the wall! Plasma screens, LED TVs and front projection systems form the majority of displays used in the home, these vary in size and quality, and our selections are based around, size, room conditions (lighting), required “feel”, and of course cost. There are a wide variety of manufacturers to choose from. We typically go for projectors from the likes of JVC, Sim2, or Sony, with screens from manufacturers such as Grandview, Screen Innovations, or Screen Excellence. Large format TVs we use are typically from LG, Loewe, Samsung or Panasonic. When there are a large number of home cinema equipment elements, making sense of driving the whole system can be tiresome and lead to many remote controls littering the room. We have a belief that technology is there to make our lives easier, and for most of our home cinema installations we bring everything together with a programmable remote or iPad App that features simple intuitive controls. For example a home page with a button marked “Watch Blu-Ray” – when you press this button, the Blu-Ray player, amplifier and screen all turn on and are set to the correct inputs, the lights dim and the Blu-Ray player controls now present themselves on the touch screen ready for you to press “play”. Simple, intuitive and convenient ! We can integrate control of the home cinema system to also cover the lighting, heating and air conditioning, also fires, curtains, blinds, TV lifts brackets and panels, door entry systems and any manner of other controllable objects and activities, in a Home Automation System. The only limit is your imagination. See our page on Home Automation Systems for further details. The Home Cinema Design page covers most of the environmental and aesthetic design within Home Cinema Systems, however other factors such as the lighting and air conditioning also may play a key role. Our showroom demonstrates some of the highest quality video projectors available. The pictures you see will simply take your breath away! Both Blu-Ray and High Definition TV at 1080 or 4K UHD can be yours to see in this stunning large screen format. 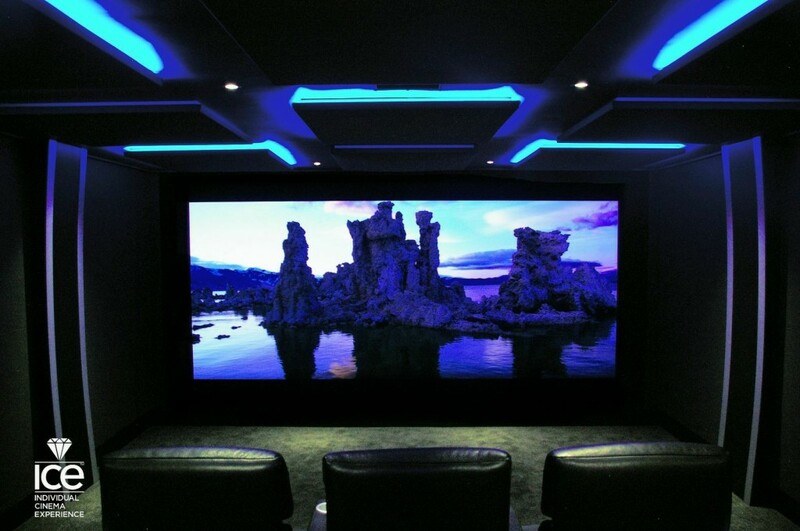 Whether it is home cinema systems built around large format TV screens, or full-on projection systems, we have a wide range of home cinema installation solutions to bring the best cinema experience to your home. 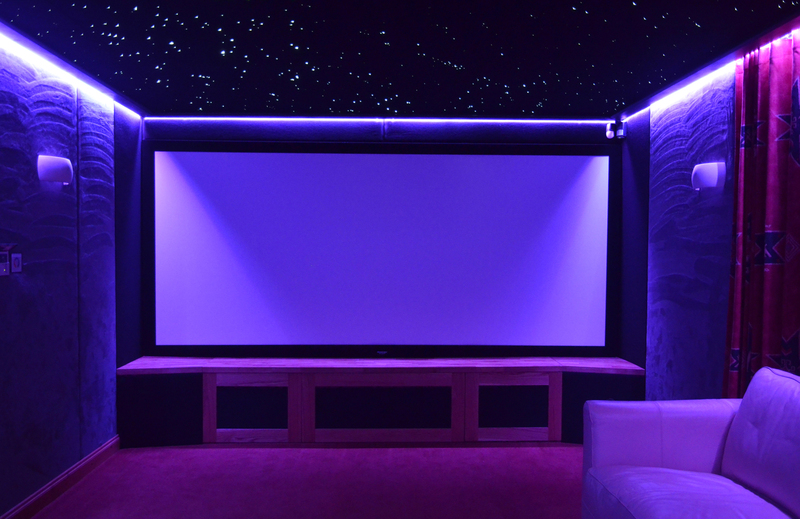 Come and experience the Home Cinema installations we can offer! Today is the first anniversary of your visit to our home ; we would like to let you know just how much we have been enjoying the standard of your installation ; not a day goes by without Martina and I discussing what a thrill it is to be surrounded by such quality, and be able to appreciate a calibre often superior to that encountered in some cinemas. We are about to embark on a new Bafta Awards Season, the DVDs and Blu-Rays have begun to trickle through our letter-box ; you can imagine how much we are looking forward to it! Our Platinum package is custom designed and tailored to the particular room. It may include acoustic room treatment, Jaw-dropping 3D sound and a wall-to wall sized Ultra-High-Resolution image. These systems are amongst the best in the world with new technologies such as Auro 3D, DTS-X and Dolby Atmos, giving you multiple dimensions. Add into this seat movement technology such as D-Box and it’ll truly transport you into the thick of the action. This is professional screening room technology not simply 5.1 or 7.1 surround sound it’s up to 64.8 surround sound depending on the size of the room, and number of seats.